EFFECTIVE today, parking charges at Kuala Lumpur City Hall (DBKL)-owned parking bays within the central business district (CBD) are increasing by 150%. 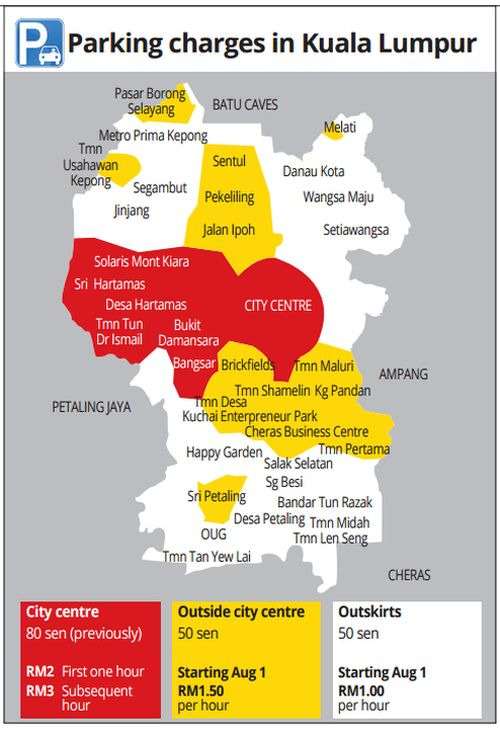 Affected areas are Bukit Bintang, Bukit Damansara, Sri Hartamas, Desa Hartamas, Solaris Mont Kiara, Taman Tun Dr Ismail and Bangsar where 75% to 100% parking spaces are taken up during peak hours. The hourly parking charges in the CBD has been increased from 80sen an hour to RM2 for the first hour. The rates have been raised to RM3 for the second hour and RM3 for the subsequent hours. This means that if you were to park from 7.30 am to 6pm, which is the usual operation hours, you will end up having to pay as much as RM32 a day. The new parking charges will be enforced in stages from now to Aug 1, which will see an increase of between 100% and 200%, depending on the locality. Rates will eventually go up by next month in zones outside the city where the parking charges are currently 50sen per hour. Depending on the zones, motorists will be charged RM1.50 or RM1 per hour, an increase of 100% and 200% respectively. 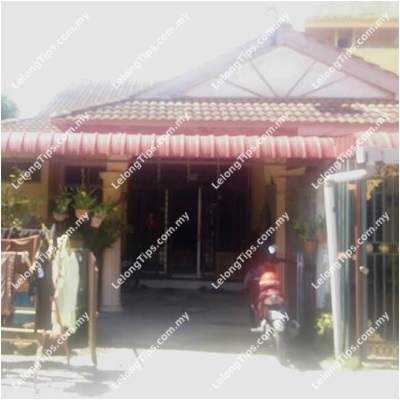 Areas include Brickfields, Taman Maluri, Cheras, Wangsa Maju and Setapak. The percentage of parking occupancy in these areas are between 55% and 75%. 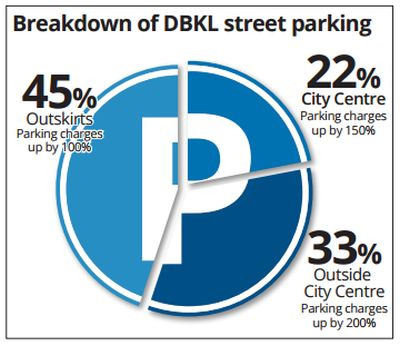 DBKL owns a total of 46,100 metered parking bays in the city; 22% or 9,914 are located at the CBD area. There will not be a maximum cap of two hours, as announced earlier by Federal Territories Minister Datuk Seri Tengku Adnan, just yet. For four decades, parking around the city had been out-sourced to a third party. 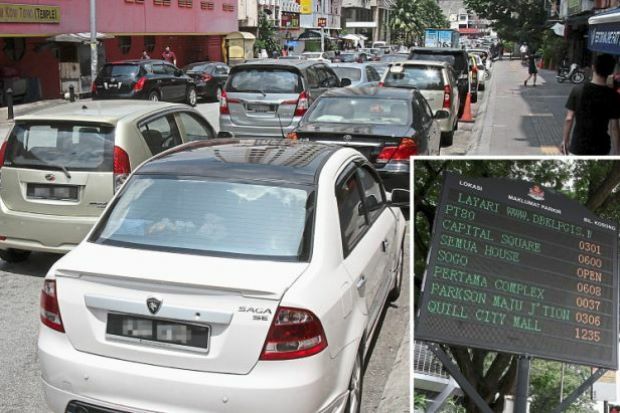 Last year, DBKL appointed Yayasan Wilayah Persekutuan (YWP), the welfare arm of The Federal Territories Ministry, to manage the city’s parking system. YWP introduced a new and advanced parking system called the City Car Park System (CCP). Under the agreement, YWP would pay DBKL 35% or RM600,000 of the gross revenue from parking every month. 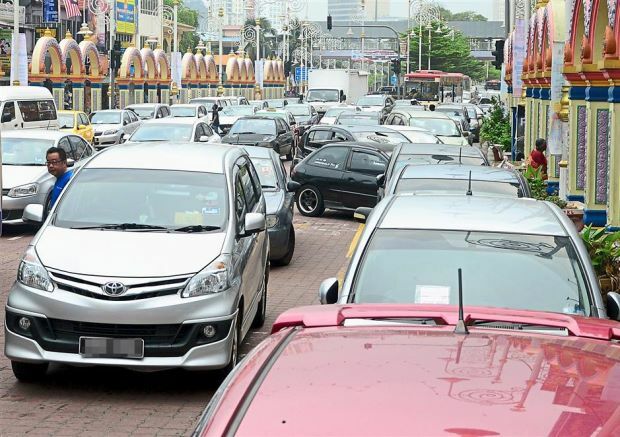 According to Kuala Lumpur mayor Datuk Seri Mohd Amin Nordin Abdul Aziz, the move to increase the parking rates was not profit driven but was the only way to ease traffic congestion in the city and encourage people to carpool. “We want to free up as many street parking spaces in the city and encourage people to take public transport or carpool to the city. 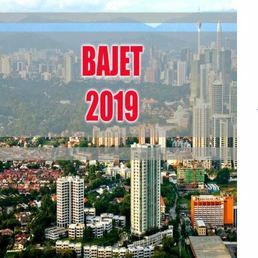 “I know I am going to be very unpopular, but it has to be done because traffic in Kuala Lumpur is already bursting at the seams,’’ Amin Nordin said. The mayor shared data obtained from the Road Transport Department (JPJ) and the Land Public Transport Commission (SPAD) to justify his decision for the high parking charges. 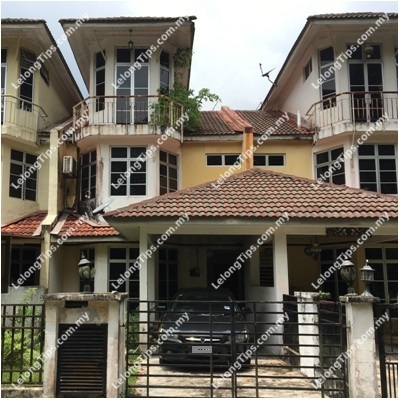 “About 50,000 new cars are registered every month in Kuala Lumpur. 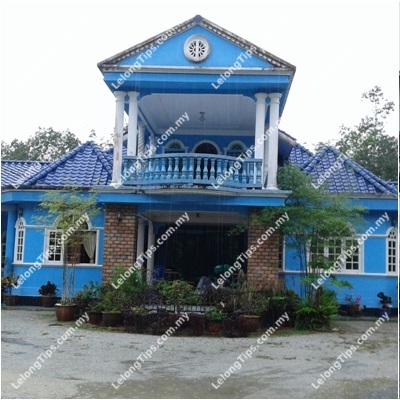 These figures are from JPJ,” Amin Nordin said. “Based on a survey carried out by SPAD, 70% of cars coming into the city centre are single-occupant vehicles (SOV). “The number of vehicles entering the city, every day, is now at a staggering 3.5 million. 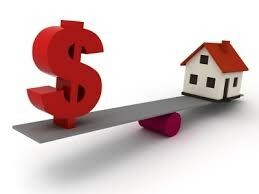 “Just imagine out of that 3.5 million, 70% or 2.4 million are SOV. “We hope the new parking charges can lead to at least a million SOV drivers to consider taking public transport or carpool to work. “If you remove one million cars from the city, you will get that Hari Raya sort of car-free roads like what we enjoyed last week. “That means everyone gets to go home to their families, earlier, to spend quality time with their loved ones and have some time to do things they enjoy,’’ he said. Amin Nordin added that the current traffic situation had made it increasingly difficult to look for parking space in the city. “We don’t want to see motorists driving in circles, looking for parking. Some drivers are double- and triple-parking on the roads causing a jam and endangering pedestrians while looking for parking. “People also have the option to park inside commercial buildings as there are now electronic boards showing the number of parking bays available,’’ he said. On the two-hour maximum limit for parking at DBKL bays, Amin Nordin said it will not be implemented yet as he wanted to give city folk a chance get used to the new parking charges. Amin Nordin said in order to solve Kuala Lumpur’s congestion issues, the push and pull factors must be considered. “On one hand we have the public transport, additional LRT lines, monorail and feeder buses to train stations which are the pull factors, said Amin Nordin. “The push factors are higher parking fees and reducing parking bays and possible congestion charges. 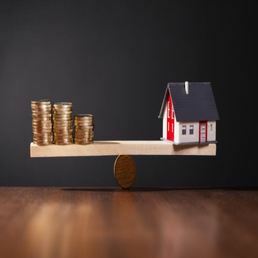 “Even for new developments in the city, we are asking developers to reduce parking bays. “This is happening everywhere in the world, even in developed countries that have first-class transportation facilities such as in London and Melbourne. Even with their excellent system, they also have a limit to parking requirements. “When it comes to parking charges, we are cheapest in the world; with the exception of Dhaka, the capital of Bangladesh. “The last time we increased parking fees was in 1984. 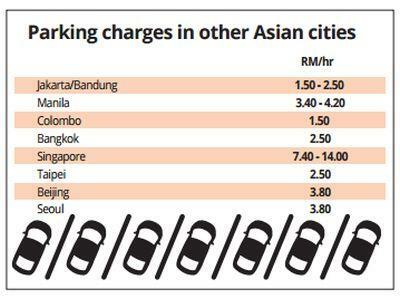 Kuala Lumpur is still the cheapest for parking when compared to other states in Malaysia,’’ he added. Amin Nordin said this was not the first time DBKL had wanted to increase the parking rates; attempts were made several times to revise the rates in 1997 and in 2001. It is no secret that DBKL is losing money in parking. Previous parking operators did not manage parking well and DBKL had trouble collecting their dues. Apart from faulty meters and an ageing technology, members of the public also took advantage of the loopholes in the system and did not pay for parking. Due to the increasing cost to support an outdated parking system that was bleeding away taxpayers monies, it was decided that YWP manage the running of DBKL’s parking. YWP chief executive officer Datuk Roslan Hassan said the new system, that cost RM23mil, used a Pay-by-Plate system consisting of a carpark software called CALE from Sweden and an enforcement system called Gtechna. “The system involves real time data transmission whereby all transactions can be observed at the command centre in DBKL,” he said. He added that parking meters located in the city had already been calibrated in line with the change and now motorists only have to key in their licence plate number and follow simple instructions to pay for their parking fees. “You can either pay by coins, Touch ‘n Go, or an e-payment method to pay for your parking fee. This can be done via smartphones by downloading the JomParking app,” he said. Apart from the convenience offered to motorists, enforcement officers can easily monitor to check and verify through their mobile device. 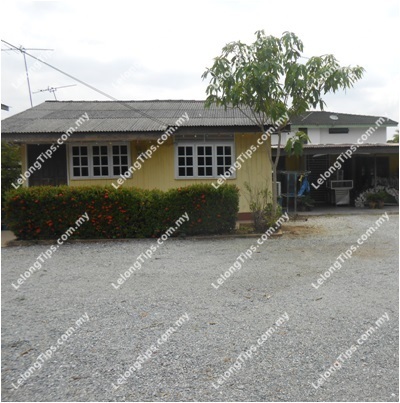 A pilot project was carried out in Taman Tun Dr Ismail last year to test the system. After initial teething problems, the system is working well there.